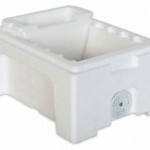 It’s recommended that poly nucs are painted before use as polystyrene degrades in sunlight. I’ve always used the cheapest masonry paint I can find – being water-based there’s no danger of damaging the polystyrene, it goes on reasonably well and is pretty hard wearing. The range of colours – in the inexpensive ranges at least – is a bit limited … white, a variety of cream or ivory shades, brick red or black. 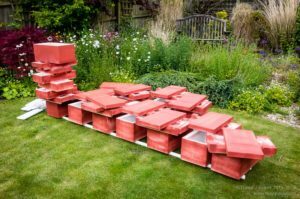 I’ve always used the brick red (though the bees would see this as black of course) from Wilkinsons, but would really prefer a leaf or dark green colour to help make the hives unobtrusive. The paint tends to a be a bit thick out of the pot, so I usually water it down by about 25% and apply a couple of coats. 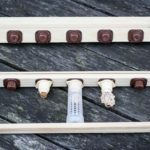 The Thorne’s Everynucs or Paynes boxes are easy to paint with a brush as all the surfaces are flat. 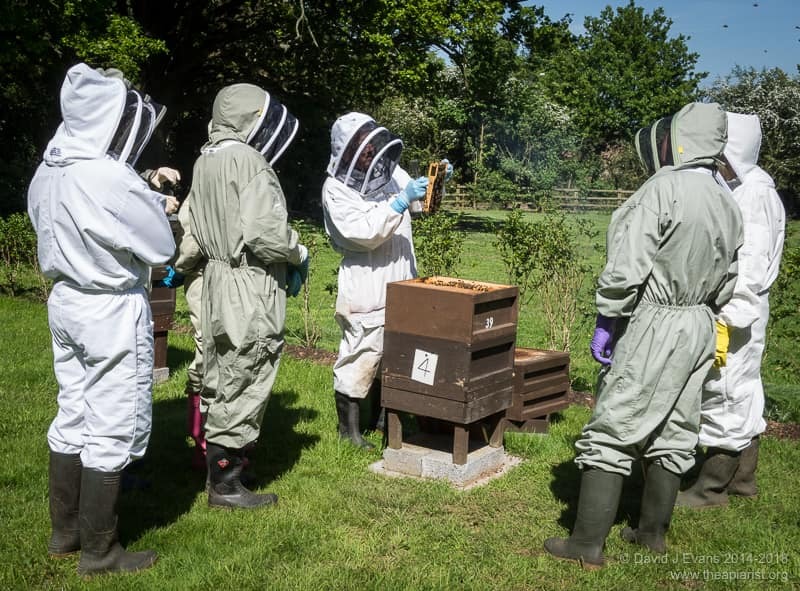 The Modern Beekeeping poly Langstroth nucs are a different matter altogether – the ‘branding’ and handles moulded into every face make painting them a real pain. 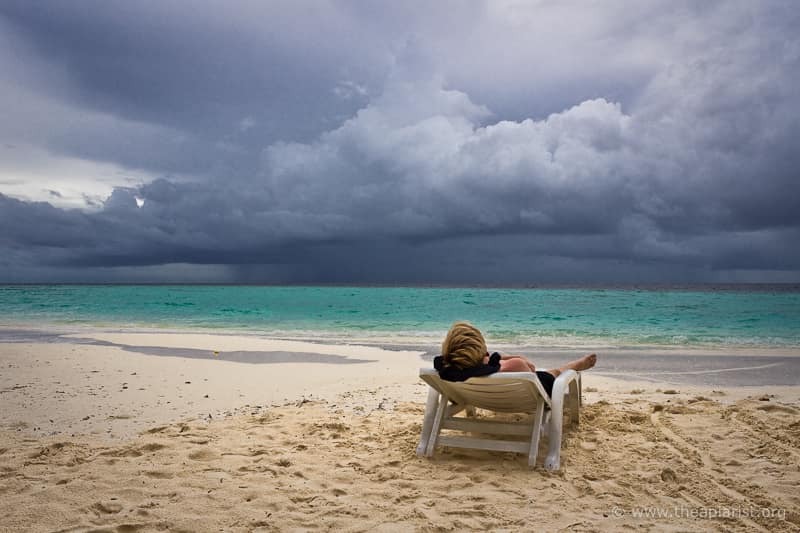 However, painting a large number of any of these boxes quickly becomes a tedious task. 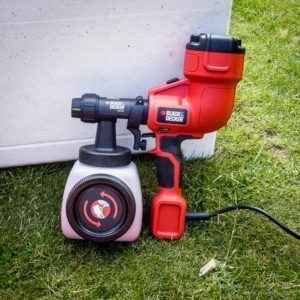 With 18 new Everynucs to paint I bought a Black and Decker HVLP (high volume low pressure) spray gun in the sales. These come with a small funnel-like contraption to measure the viscosity of the paint. Out of the tin the masonry paint I’ve got was far too thick and gloopy, but with enough water and lots of stirring I readily achieved the right consistency. After that the painting was a doddle. 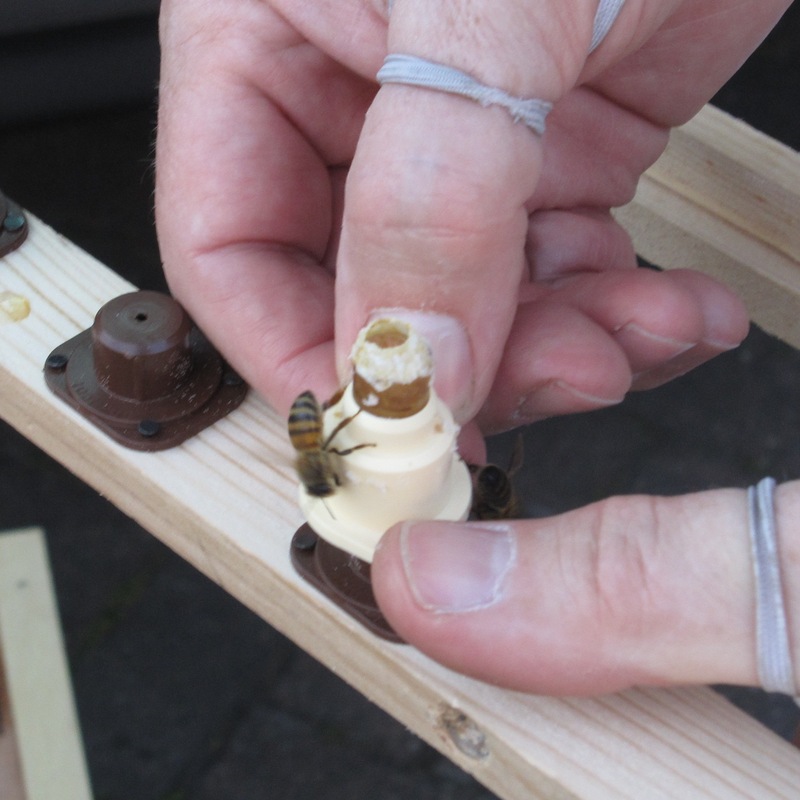 In two hours – as two one hour stints – I painted a dozen Everynucs with two coats. A few areas were a bit patchy as I got the hang of the paint gun. 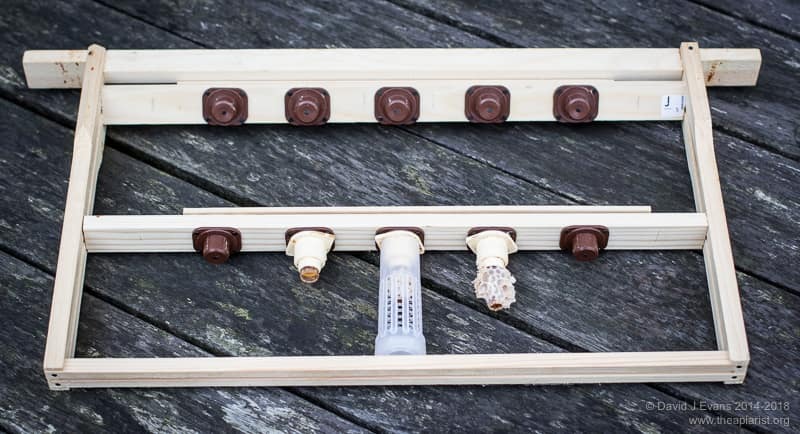 These paint guns are essentially strong hairdryers so there are few moving parts – the nozzles and paint reservoir are easily rinsed out and cleaning probably took no more than 10 minutes. 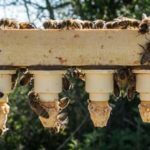 This entry was posted in Beekeeping, DIY, Hives and nucs, Tools and tagged DIY, hive, mini nucs, poly on June 27, 2015 by David. There was a thread on SBAi a year or so ago in which “Kieth” asked for advice on keeping wasps. Kieth never returned to the thread, but there were a number of increasingly surreal contributions on waspkeeping. 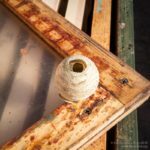 I was searching through a pile of equipment stacked in a corner and discovered this wasps nest attached to an old Perspex crownboard. 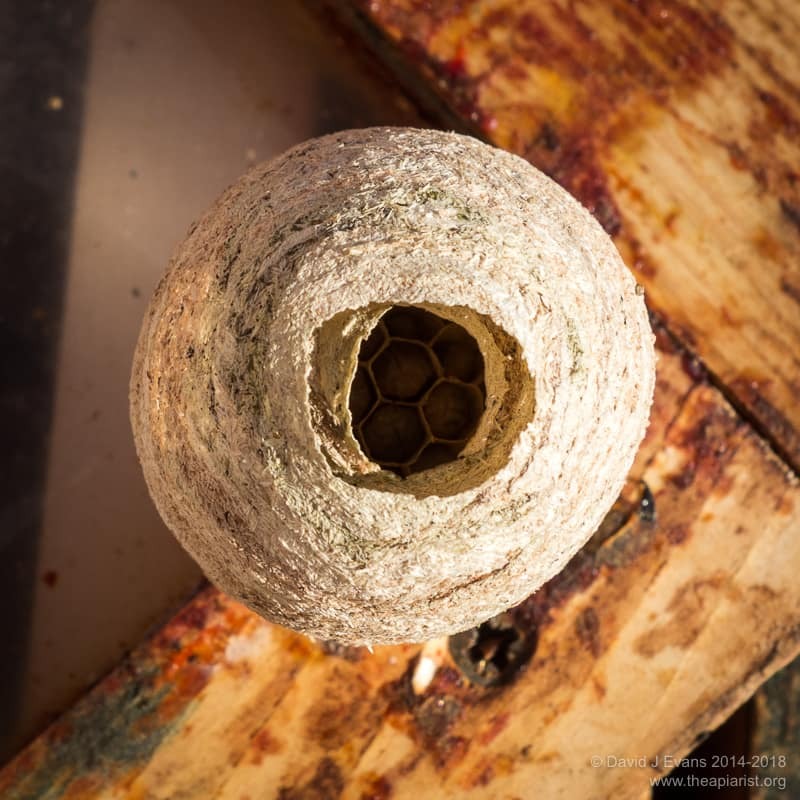 The nest is paper-thin, made out of wood pulp (and presumably wasp saliva), beautifully crafted with a double layered entrance and a cluster of larvae in the ‘roof’ (the picture shows the nest upside down). If you look carefully in the image below you can see the developing larvae. 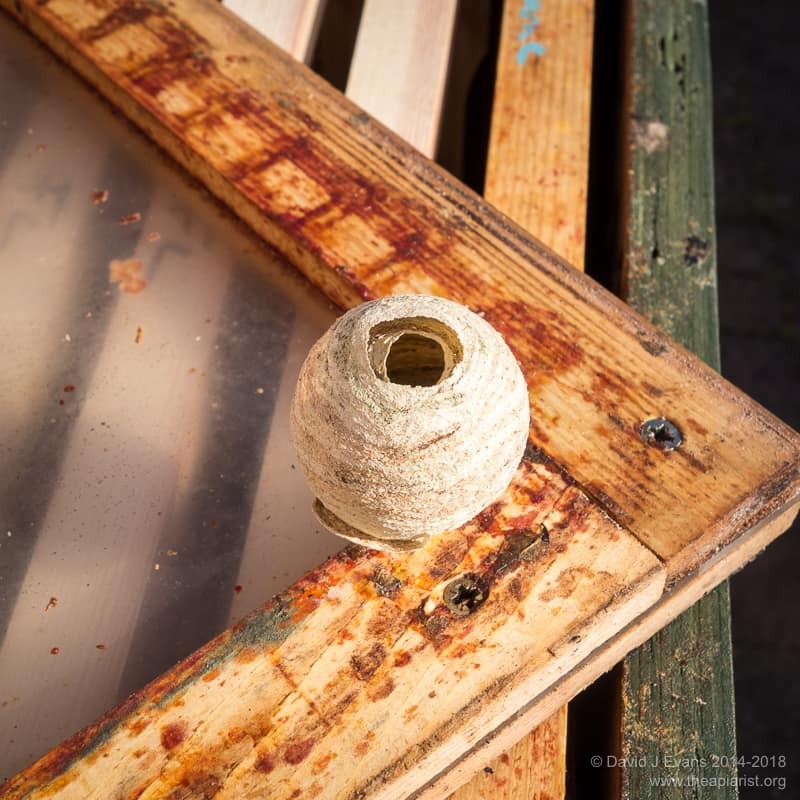 There were perhaps 15 or 20 of them, each occupying a small hexagonal cell … but remember these will return later in the season to wreak havoc with weaker nucs or late season mating nucs. 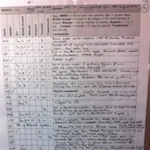 This entry was posted in Beekeeping, Wasps and tagged crownboard, mini nucs, surreal, wasps on May 18, 2014 by David. 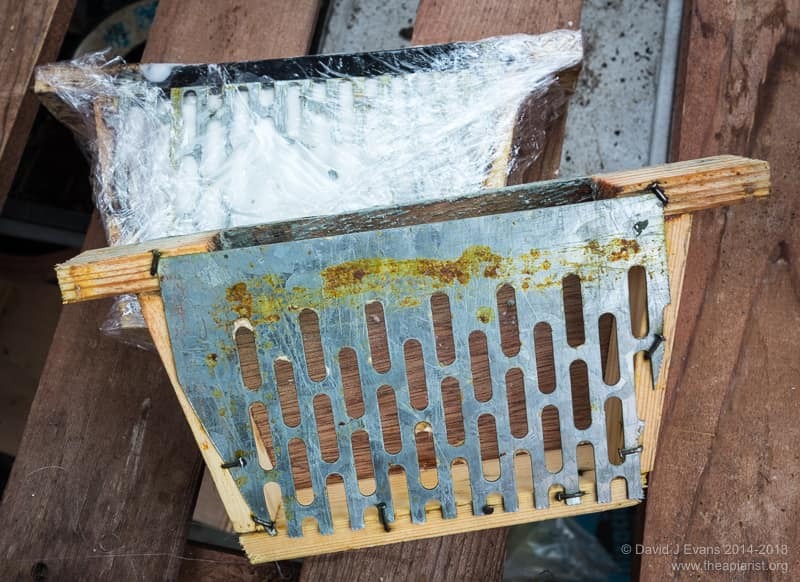 The polystyrene frame feeder supplied with Kieler mini mating nucs occupies one third of the box (see image right from Modern Beekeeping). 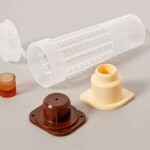 Although it can be used to feed syrup or fondant it only fits the bottom box and is too deep to be used in the upper body. 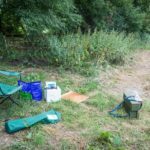 To overwinter queens and small colonies in these boxes they usually need to be double depth. 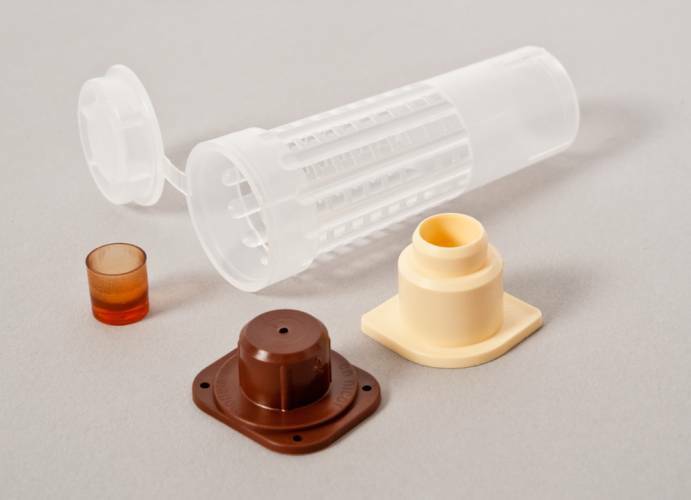 This causes two problems – the feeder is often below the cluster and refilling it, or even checking to see if it needs topping up, requires separating the upper and lower body. 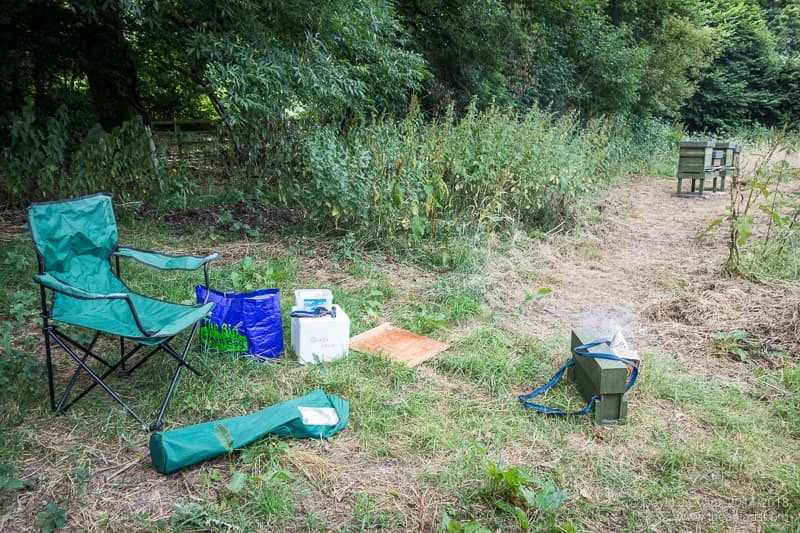 Even during the queen rearing season the supplied feeder is not ideal – by occupying a third of the box it takes valuable space bees and brood could occupy. To overcome these problems I build simple frame feeders to take fondant. Using scrap wood and some offcut queen excluder they occupy half the space of the supplied polystyrene feeder. With 21 mm softwood for the frame these can take ~200g of fondant. They can be used in either the lower or upper body of the mini nuc. I place them at the opposite end of the box to the entrance, immediately below the plastic sheet used as a cover board. 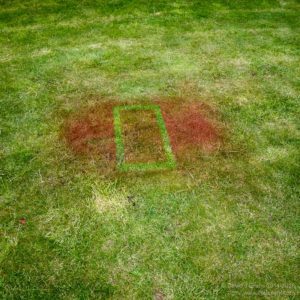 Checking them only requires lifting the corner of the plastic and replacing them takes just a few seconds – in mid-winter this can usually be achieved without disturbing the colony at all. 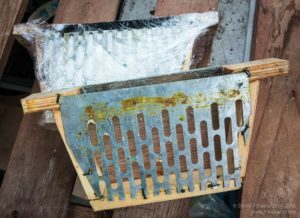 Finally, unlike the supplied poly feeder, I’ve never had brace comb built within one of these frame feeders and so the queen doesn’t enter them. Overwintering queens in mini-nucs is usually possible in the UK and will be covered in a future post. 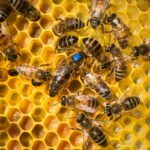 This entry was posted in Beekeeping, DIY, Feeding, Queen rearing and tagged DIY, Kieler, mini nucs, queen rearing on February 9, 2014 by David.